Andrew Crawford presenting the Selling Yourself workshop. 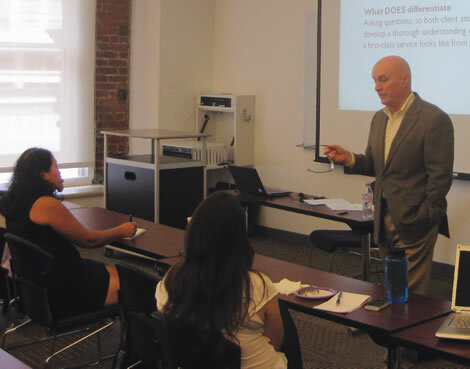 NCTA members had an opportunity to experience what large consulting firms pay the big bucks to hear as Andrew Crawford of Crawford Consulting International, Inc., shared key insights from his decades of experience in this April 16 workshop in San Francisco. The workshop titled, “Techniques for successful selling – a new approach to selling to direct clients,” attracted a diverse group of participants: corporate members seeking to improve their client relationships and freelancers who already focus or wish to focus on direct client relationships. Andrew provided a lively and interactive atmosphere, listening to us about our needs in the very way he encouraged us to listen to our clients about their needs. First, the basics: How do we define ourselves as service providers, what does our ideal client look like, and how would we like to improve the sales process with our clients? The next phase is to distinguish ourselves as premium language consultants and build a trusted advisor relationship with our clients. From the feedback he has gleaned from end clients throughout his long career, Andrew helped us identify what does and does not work here. Tricks, techniques, style over substance and gab do not differentiate – savvy clients ultimately see through this. Slavishly complying with every random client request is also a dead end, as it puts us in the role of servants rather than partners to our clients and confuses what clients want (or think they want) with what they need. Our job as language experts is to deftly steer our clients toward the latter. Finally, competing on price is a losing game: haggling is dishonest and degrading for both parties and does not project seriousness, and aggressive price-driven promotions or concessions move the subject away from value (a positive) toward cost (a negative). When the dialog focuses too heavily on price, as it inevitably will, we must ask our clients to define what value means for them beyond price. Clients have a goal in purchasing our language services – expanding into new markets, reaching out to foreign customers – so our job is to focus on that and position our fee as an investment rather than a cost. Practice honesty, realism and a willingness to confront difficult issues. Instead of telling our clients all about what makes us so great, we must encourage our clients to tell us about their needs and what a first-class service looks like from their perspective. This builds a trusted advisor relationship and demonstrates our ability to listen and our interest in the client’s unique requirements. Andrew spoke of the “three Cs” of David Maister in their order of importance as rated by buyers: compatibility, confidence, and capability. Compatibility is about the intangible rapport we enjoy with the client. Confidence means that we are trusted advisors to the client – something that takes on added importance in the language services industry, where clients often lack the ability to directly evaluate our work. Capability speaks to our quality and the skill set we bring with us. Note that the first two Cs are about the client, and only the third is about us. Note also that “cost” is not one of the three Cs! Finally, Andrew worked with us on the business development process. We defined the “perfect” client vs. the PITA (pain in the you-know-where). We honed our elevator speeches and practiced them on one another. We talked about the importance of soliciting and accepting feedback in a positive manner (“What can I do even better?”) and asking effective questions to build compatibility and confidence. A critical tool in the business development process is referrals. Referrals are the most powerful, cost-effective element in our marketing mix, with the lowest cost of sales and the fastest sales cycle. Andrew distinguished active referrals from passive referrals: asking our clients to refer us rather than waiting for our clients to notice how brilliant we are and mention us to their industry colleagues. But how do we get our good clients to help us find other good clients? After completing a particularly successful project, we might set up a meeting or at least initiate a dialog with the client to review our collaborative process. Listen to the client’s feedback and reconfirm the value we provide. Mention that we “need another client just like you” and ask our client to introduce us to just such a peer. Nina posted this article under Business, Education	on Thursday, September 1st, 2011 at 12:05 pm	You can follow any responses to this entry through the RSS 2.0 feed. Both comments and pings are currently closed.